It is 11:07 a.m. and I am printing out a job to proofread and drinking coffee out of my Bye Bye, Pie mug. It has been awhile since I hawked my merchandise. Be cool! Buy Bye Bye, Pie! merchandise! Wow. Do you think I should give up this proofreading career and go into marketing? Because I think I can hear the crowds stampeding to buy my tshirts and mugs. With that persuasive copy, up there. Every time someone buys a design I haven't bought, I think, Now I want to buy that style. I like the V-neck look, and I totally want to be wearing Norma and Vern on my chest like that. For those of you just tuning in, that couple featured on my masthead are Norma and Vern. I do not know them. And yet I own 8,000 photographs of them. I know. What can I tell you? Anyway, there is nothing dramatic happening at my house. Oh, except we have turtles. And daffodils. We came to look at this house right at this time of year. Tallulah was just a puppy so we had to take her with us house-hunting. I'm certain people were delighted to have a rambunctious puppy in their homes. Screw 'em. At any rate, I remember pulling up to this house and the yard was full of daffodils. This past week they have been out in full force, whatever that means. I think we have more this year than the past two years. I have no idea why. They seem to have minds of their own. I know I mentioned to you that Marvin got turtles for his classroom, who he named Flo and Eddie but who I keep calling Cuff and Link (the turtles, not his classroom). He had a field trip on Friday and then spring (lowercase) break next week, so he just decided to bring them home for awhile, and I am certain it's been relaxing for them, with Winston's giant cat head watching their every move like this. Winston did this for, oh, nine hours when they first got here. So we moved them into the bedroom. Which only served to alert Henry, so then TWO huge scary cat heads were watching their every move. "Gee, thanks. Sure am glad we moved to this house. This is so much more relaxing than when 30 kids threw erasers into our tank." Finally Marvin got them a whole different aquarium and moved them into the 1940s standup radio we have in the back room. I went back there to photograph it for you, but you can't really see in. But you know what you can see? Francis' big scary cat head sitting right next to the aquarium. It's the first time he's gotten up in two years. It's like in Willy Wonka when that grandpa finally gets out of bed to go to the chocolate factory. I like how Fran matches the keyboard. 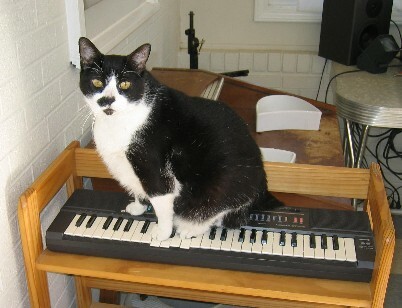 And won't Marvin be happy when he sees Frannie smashing the keys. I wonder what he's playing. Maybe He Ain't Heavy, He's My Francis. In other non-turtle-related news, it's been nice out, so I have been leaving the back door open, because I'm your back door man, and I am delighted to report that Tallulah has been hanging on the deck like a normal dog. Honestly, it's the first time she has ever moved three inches from me since we got her. Since day one she has sat right next to me, and if I go five minutes not noticing her, she says, "Mmmm!" I realize she can't say much else, although she is also capable of saying, "Rrrrr!" when someone has the nerve to walk by with a stroller (it's the pit bull in her, I guess), and I just can't begin to tell you how nice it is to get a half-hour to myself. Without the "Mmmm!" In fact, am tempted to go nudge her with my nose and say, "Mmmm!" myself, just to see how she likes it. I think I am going to get a pedicure today. I have not had one since I quit my job, as I have felt guilty about spending the money. However, I worked every day of February and March, except for the days I was in Seattle (and I worked on the plane), so forget it. I'm spending that $18 and you can't make me feel guilty. I think I am going for a sky blue or some other similarly trashy color. My toes, my choice. You are ALL my favorites today!! That was a lovely series of comments to read first thing this morning, so love to you all. Especially Hulk. We have a daffodil festival just outside of Little Rock this weekend. There is a small mountaintop just covered with them and people take their kids up and take pictures, and you can buy bulbs and it’s just a grand old time. June – your toes are where you can rock the wild stuff. I usually keep my nails pretty conservative, but my toes have a french manicure with black tips and they are AWESOME. When I went on a cruise back in October I got tons of compliments on my “originality”. Twenties = blue toenail polish. So true. I wore electric blue on my toes for my first wedding…I haven’t let that ruin the color for me though in my 30’s. It’s just that my legs/ankles/feet used to be, you know, TAN-ish. Now I’m a work-y work-y sunscreen SPF 90 kinda gal…my electric blue toes make me look goth. Hey, but that’s hip, right?? Haha! See, now I have career AND I’m cool. It snowed last night. About 4 inches. Love me some northern British Columbia springtime. Is Fran playing that tune in a major or minor key? You crack me up! Poor turtles, poor Fran. Not so sure about spring around here…there not being enough bushy stuff to trim and all because winter will NOT go away. BUT, I do want to say right here and now that the KSU Wildcats are gonna whoop Xavier on Thursday! Go Powercats!! And yes, I am from Kansas, and yes, I am surviving the Jayhawkers loss because the Cats rule. Oh, your kitties are having SUCH a fun spring break and they didn’t even have to leave home!!! The pics and commentary just crack me up, especially Henry going to great lenghts to see the turtles. Our dog once saw a turtle on the deck one story below our kitchen window and went ballistic. I am not sure how she noticed it, it blended. Also not sure how the turtle got up to the deck, the first step being a doozy and all. One year, on Mother’s Day, she found one in the woods and carried it around wedged in her jaw width-wise. The turtle was not hurt, I had to get it from her and place it outside the limits of the electric fence. Hulkie, there are some spring bulbs that you could plant by your euonymous. Two of my friends painted their toes a pale blue for their weddings (two separate girls, two separate weddings) as their “something blue”. It was cute, and not too obvious. I think my one friend’s photographer even took a picture of her pale blue toes. So I say yes to a blue pedicure! Is anyone else out there a pedicure-phobe? I want to like them because it looks so relaxing, but I really, really don’t. GO GET THAT PEDDI! YOU DESERVE IT! My mom used to say always wear clean underware just in case you are in an accident….Well if the accident is bad enough….well you get the picture! Beautiful sky blue toe nails might just divert the attention, you know, just in case. 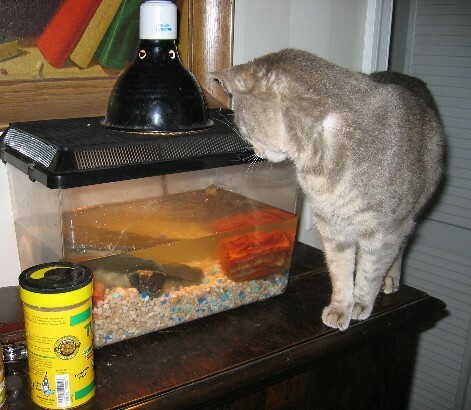 The turtles probably feel like they are on the Twilight Zone what with the giant animals peering in on them. BTW, I would love to see a full shot of the house to see all the daffodils at once. I have cute little crocuses coming up. I can’t wait till Ricky and David can go back to the classroom for safety. 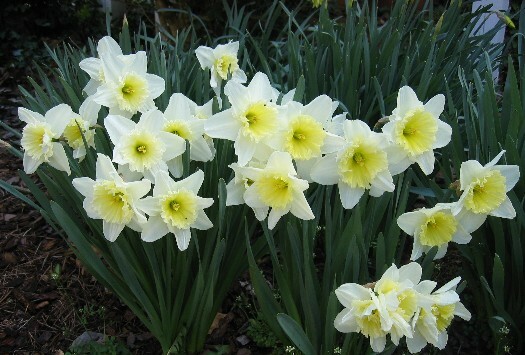 Daffodils, especially the two-tone ones like you have, are my absolute favorite. And peonies. And lily of the valley. I can’t wait ’til spring keeps on springing here. I mostly can’t wait til I live in not-an-apartment so I can have dirt and plants of my own. Hulk, yes. As long as the daffodils will be in sunny spot, they’ll be happy. Just keep your bushes trimmed. 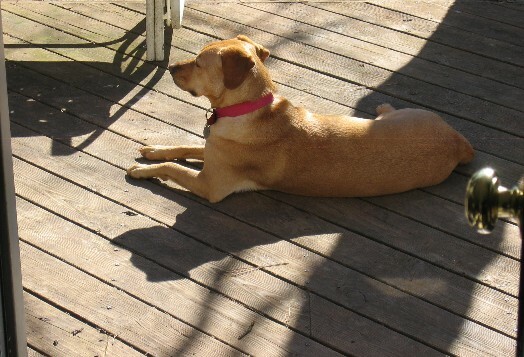 Look at Lulu puppy uppy duppy soaking up the sun. Fawn Amber! We DO have the same shirt! Squee! Only your dog isn’t pointing out, um, your picture of Vern and Norma like she’s Vanna White or something. Daffodil yellow. Blue is sooooo when we were all in our twenties. Out to garden in the rain. Because I am a nutty neighbor and I like to give the folks on the street something to talk about. “Ball games and broads.” Heeeee. I LOVE IT. Pardon the hell out of me, but I’d rather have that than an Alan Alda/Phil Donahue Nancyboy asking about my feeeeeeeeelings. Pleh. Not that anyone asked. Carry on. at a bracket past the next game for XU..one game at a time. Congrats though. Ah, I don’t pay attention to all that space-stuff. Ball games and broads, man. That’s what I’m all about. Now. The daffodils. Can I plant them next to the house between my euonymus bushes? I texted you from the AIRPORT, all in one SITTING. But then I turned off the phone from that day until today. Are you unable to sense time, and when it passes, Hulk? Is that whole space-time continuum thing baffling you?? How’d you text me 15 times then?? I have seen that movie at least 20 times and JUST NOW got what Butkus meant. Gotta give you props for your Xavier squad, tho. And how ’bout my Bucks?? MY girl Fawn Amber picked them just for me, you know…beat THAT! Cuff and Link…why didn’t you name the dog “Butkus”? Maybe one foot sky blue and the other daffodil yellow. You know a little variety. Fawn Amber, how you doin? Anyway, my son’s school had a 7th grade gathering the other night with a girls’ activity room and a boys’. I dealt poker in the boys’ room and was stunned a couple of times as a boy’s hand reached for the cards covered in red fingernail polish. The hands, not the cards. 13 is a year during which some of the boys are maturing and some, not yet. Strangely, the “maturing” ones (meaning they have noticed the girls like Fawn Amber) were the more likely to have the polish. My point being, the red didn’t really look good, so perhaps robin’s egg blue would have really brought out the eye on the Queen of Hearts. ?? Am I the only one with mutant toe nails too small to paint? What the Hell? You guys are going to think I’m a Cyclops shut-in because I am so different from y’all. Geesh! Yay Fawn Amber! 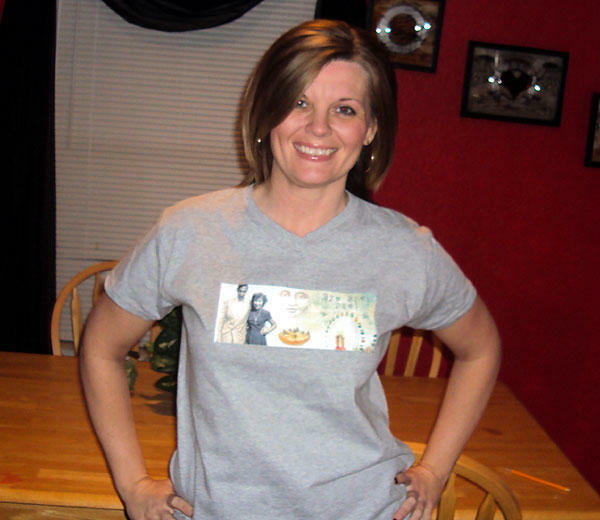 You model that shirt girl. Daffodils don’t have a chance to multiply at my house. They are in the borders in my back yard. It has been a rainy, soggy, wet mess of a spring so far and my dogs won’t go on the muddy part of the yard that should be grass. So they do their business on the mulch in the borders. I’m lucky I have any perennials left. Spoiled brats. Something about bulbs, the way they divide and reproduce themselves and just show up every year is just magical, isn’t it? Go with the blue or green for your toes! I get mine done every 6 weeks and right now I am sporting a beautiful shade of blue/green with pink sparklies on the big toes. Very spring-St.Paddy’s-Easter-ish. How big are those turtle guys? One of my clients has a HUGE turtle that she has had since she was like 8 or 9 years old. But he is about the size of a half soccer ball. I think his life expectancy is really long! Fawn Amber is as lovely as I thought someone with the name Fawn Amber would be and yes, now I want Norma and Vern. Can we get those crazy kids on the cup, too? A girl can never have enough favorite coffee cups. Love the pics of the predators stalking their prey. We have this annual carnival that’s kind of a big deal in our little town. Kind of like that carnival in Steel Magnolias. Although we have no Shirley Maclaine crotchety character in our little town. Man, I wish we did, though. Anyway, my husband always gets carried away and wins a bunch of stinkin’ goldfish like he’s going to save them from their cruel fate. 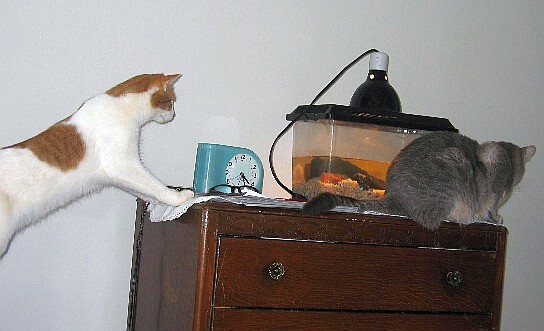 Unfortunately, there was the year of the great goldfish slaughter where we woke up to our cat smugly whipping her tail back and forth as she relaxed stuffed to the brim, next to the empty tank. She had managed to pry off the lid. My husband never tried to save the goldfish again. I got my first pedicure since September this weekend, and the salon was PACKED. Geuss everyone else had the same thought. I have a lovely shimmery tangerine-y color on my toes now. Love. Yes, you should get that pedicure. I did green toes last summer, and it looked horrible. The plan was to put ladybug decals on it and have it look cute. The decal stickers were see-throughis and turned into brown clumps. So I don’t recommend that. I am partial to blue as well, that’s is what I wore in my twenties as well. And last year to the No Doubt concert when I pretended to be in my twenties again. June, the wonderful thing about daffodils is there ARE more of them each year. We semi pro gardeners call that naturalizing, since we are way too high falutin’ to say that just bes more of them each year. When we bought the Hudarosa, the former tenants (who we revile in a huge way) had planted little bitty azaleas along the sidewalk, which we christened the “Buy Me Azaleas” or just the “buy mes.” They are no longer itty bitty and like your nice neighbor’s bushes, put on quite the little show. Oh my goodness, am I the first commenter??? I’m jealous of your daffodils. It snowed all weekend in Michigan!